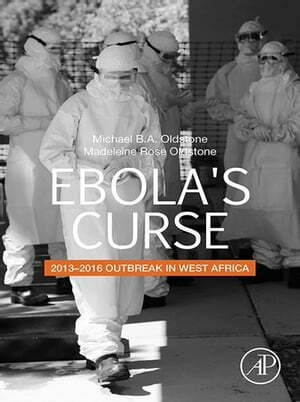 Collins Booksellers - Ebola's Curse by Michael B.A. Oldstone & Madeleine R. Oldstone, 9780128138892. Buy this book online. Ebola‘s Curse: 2013-2016 Outbreak in West Africa is about hemorrhagic fever viruses, especially Ebola, its initial origin in central Africa 1976, its unprecedented appearance in West Africa in 2013. The book records in sequence and detective style how the initial outbreak of Ebola from the index case in rural Guinea traveled to Sierra Leone, the work and fate of those working in the Kenema Government Hospital (KGH) isolation ward in Sierra Leone. The book provides vignettes of the three main players involved with Ebola at KGH, Sheik Khan, Pardis Sabeti, and Robert Garry. Khan was the head of the unit, declared a national hero by his Sierra Leone government. He died fighting Ebola and was/is recognized in the USA by American societies by awards created for his historic work and death. Pardis Sabeti, a geneticist from Harvard and Broad MIT Institute, who was honored as a "Scientist of the Year" by Time Magazine and the Smithsonian Institute. Robert Garry, head of the operation to fight hemorrhagic fevers and Ebola, shuttled between Tulane University, KGH, and The White House to make aware through the press and others the dilemma and tragedy that was unfolding, and the need to obtain additional medical and health care support and supplies. Sabeti and Garry currently work with Oldstone on Ebola at KGH and thus personal communication and knowledge was/is available to the author for the book.